A Faster Human: Are We Unique In Our Ability To Get Better? : The Two-Way For decades, the speed of racehorses and dogs has stagnated. But humans keep getting faster. On the 60th anniversary of the first time a human ran a mile in under 4 minutes, we ponder why. 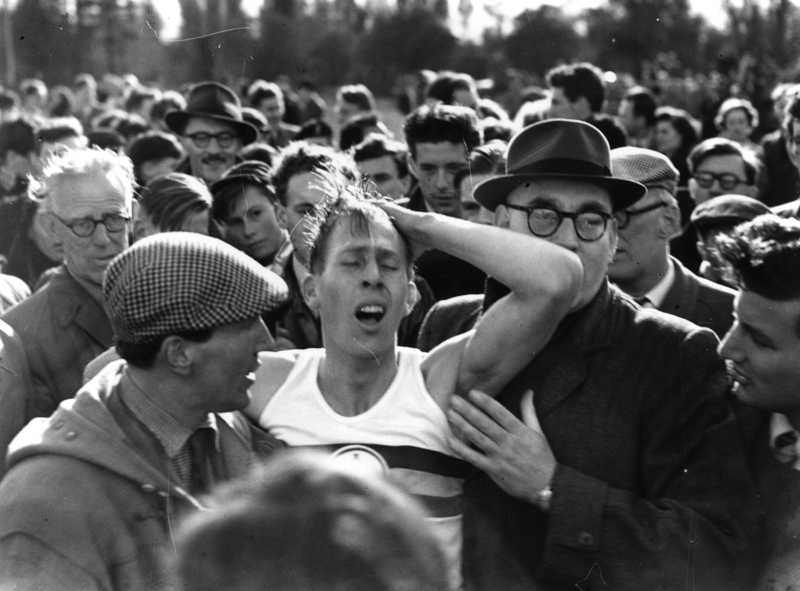 English athlete Roger Bannister among a crowd at Oxford after becoming the first person in the world to run a mile in under 4 minutes (3:59.4). Sixty years ago today, Roger Bannister accomplished something humans had only dreamed of decades earlier. As he's described it, the first two laps felt easy, and black-and-white BBC footage of the event corroborates this. He looks at ease, his spikes hardly touching the track before springing another step. When he hit the final lap, the British medical student knew he had to run those last 400 meters in 59 seconds if he was to break the world record. Right before the last straightaway, Bannister sped past his pace runner. He could see the finish line tape, and he could hear the crowd. He leaped toward the finish, his body feeling "like an exploding flashbulb" as he fell into the arms of his coaches. Bannister had become the first human to run a mile in under 4 minutes, shattering all sorts of notions about the limits of human performance. Perhaps just as shocking, that record lasted only six weeks — and subsequent records continued to fall until 1999, when Hicham El Guerrouj of Morocco ran the mile in 3:43.13. As we thought about the 1954 feat and how humans keep pushing the limits of what was once thought impossible, we wondered if it made us unique. Have animals, for example, gotten faster? "The best data-based, short answer to your question is no," says Peter Weyand, a Southern Methodist University professor of applied physiology and biomechanics who specializes in the limits of human performance. Specifically, he was referring to a landmark 2008 study by Stanford biologist Mark Denny. Denny looked back at as much as a century's worth of records and found that while the performance of racing horses and greyhounds has stagnated for decades, humans have continued to improve. "The superficial, easy answer why is that you can only get so much out of selective breeding, and [the horses and dogs] are optimized, and there's nothing more you can do," Weyand says. "Why are humans getting faster? That part is really complicated, and it's only a partially biological phenomenon." For example: When Bannister broke the 4-minute mile record, he was running on a track made of crushed cinders and dirt. Modern rubber or synthetic tracks will shave three to four seconds off a runner's time per mile. Performance-enhancing drugs and a whole suite of available supplements — like vitamins — also can give an edge. But much more is at play here, Weyand says. He compares it to Moore's Law, the theory posited by Intel co-founder Gordon Moore that the number of "transistors incorporated in a chip will approximately double every 24 months." In other words, an industry driven by strong competition and the promise of large financial gains is going to move faster than nearly all other industries. Essentially what Weyand argues is that human runners are at a similar, special confluence, where competition, rewards and technology are all working together toward a faster human. "Track and field is a hypercompetitive, professional sport," he says. "You have a large population basis and very substantial economic incentives to improve that have evolved in parallel with advanced means for performance improvement." He adds: "If there are means [to get faster] — legal or not — they are going to be implemented." Weyand says that gene doping and prosthetics could prove the next frontier. But when it comes to the mile, something curious has happened in the past 15 years. Hicham El Guerrouj's 1999 performance still stands as the very best. That stagnation, Weyand says, happens to coincide with when the International Association of Athletics Federations and the Olympics started to test for erythropoietin, a popular performance-enhancing drug. So does this mean that humans, like racehorses and dogs, may have reached their biological limit? "That may be the case, but I'd be hesitant to make that prediction, because you don't know where you might get some other improvements, whether it's through training or equipment or the tracks themselves or other things," Weyand says. That's what makes humans different: The number of "interventions" that can have an effect on human performance is abundant.